Food & drink news ft. Mackie Mayor opens, wine tastings & more. 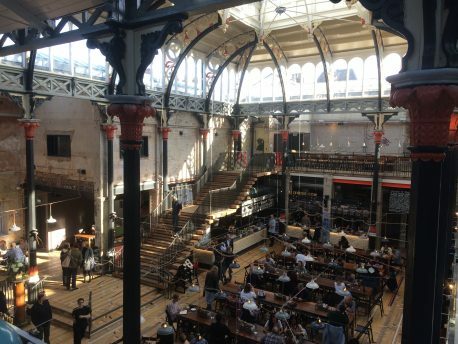 Altrincham Market’s new outlet in the city opened today (Tue 17 Oct). Over the past couple of weeks, tantalising photos have graced their social media channels, showing menus being worked up alongside sensitive restoration of the beautiful Grade II listed building. We went for a look around and found Fin Fish Bar serving sustainable fish cooked over charcoal, Tender Cow offering the best in beef, Baohouse’s fresh, homemade Taiwanese steamed buns, Honest Crust with their signature pizzas, baked goodies from Katie’s Cakes, Nationale 7 offering rotisserie and many more. Opening day has long been anticipated – as they bed into the new venue, they’re opening the ground floor first and the mezzanine in the following couple of weeks. A welcome addition to Manchester’s gastronomic landscape – and that of the Northern Quarter. Situated on Booth Street, new restaurant and bar 1761 is set to open next month. Currently recruiting, the venue is inspired by Manchester’s Industrial Revolution and will serve ‘modern British food and drink done well, from Manchester, in Manchester, for Manchester.’ Watch this space for further details and official opening date. Local wine suppliers C&O Wines and West Didsbury gastropub The George Charles are joining forces to hold a wine tasting event with the theme of classic old world wines versus new world counterparts. Over the evening, guests will sample four whites and four reds, with accompanying dishes served from the kitchen. Book your places via the link below. The Ancoats festival returns for another year. Held at Wellington Mill, the day will involve a whole host of live bands, DJs, art, fashion, comedy, spoken word and a dog show. Particular highlights include John Robb in conversation with Pete Lawrence on the impact of Artificial Intelligence on our lives, and Tobin Lochrie’s Northern Soul dance class. Offering sustenance through that packed schedule, Mama Sue’s will be serving veggie and meaty deep south American street food, Gourmegg will be there for all your scotch egg needs, the Vegan Organic Network have got your back, and there will be a house bar with plenty of craft beer, wine and soft drinks, too. Tickets and details on full listings are available via the link below. Read our preview here. For one night only, Stretford Canteen is back. Appearing at Heaton Moor venue Pokusevski + Catena, they will be serving guests a four-course set menu. Meat or vegan menus are available and all food will be locally sourced, organic and gluten free. The bar will be open as usual, with vegan wines, beers and cocktail on offer. In the stunning surroundings of Manchester Cathedral, hangingditch’s two day festival is back for 2017. Too big now to occupy the shop, the neighbouring Cathedral now plays host to the event. With an unholy amount of wine, gin, whisky, champagne and sherry to sample, there will also be food from Umezushi, Harvey & Brockless, Brindisa and Beehive Food. There are sessions on Friday night, Saturday afternoon and Saturday evening, with various experts present to guide you through wine bouquets and notes aplenty. It’s a popular event, so book now to avoid missing out.